Last night I had a conversation with a kindred spirit. He's a fellow Project Manager, who often finds himself running difficult projects, and is President of a professional organization. As we talked, the conversation moved to people who constantly "provide suggestions" and how to handle them and their suggestions. We haven't focused on that and it sounds like you have a good handle on it. Can I get you involved in helping resolve the issue? My friend had different wording, but it leads to the same results. This is one of the most powerful phrases you can teach people who are dealing with a lot of stakeholders and / or working in a volunteer organization. The funny thing is that most people don't understand the power of the phrase until they've used it a couple of times. In fact, many have openly doubted its effectiveness. Then the amazement sets in. The person who is providing the suggestion feels like (s)he is honestly being listened to (which is as it should be), and that the suggestion provided is actually being considered (which may or may not be the case). 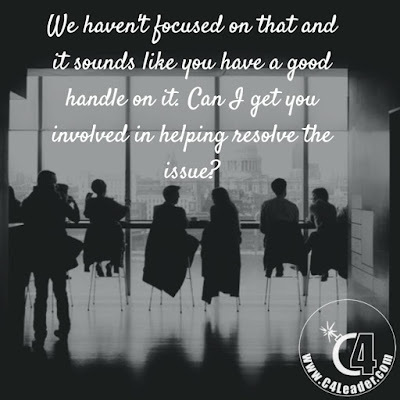 If the person accepts the offer to get involved, you now have a volunteer who is passionate about resolving a particular topic and is usually dedicated to the topic until it is complete. If the person becomes involved, they are now directly responsible for the implementation of the suggestion. This makes it more difficult for the person to come back around later and comment about the suggestion not being implemented. If the person declines to be involved, if (when) they comment about the suggestion again, you can reply that it could have been implemented, but you really did need their involvement. This means it is their lack of involvement that stalled the suggestion, making them again responsible for the lack of implementation. My friend noted that only about 10% of the time will people actually chose to get involved, but about 80% of the time people will feel that they've been listened to and will leave the encounter happy. The remaining 10% of the time is typically people who won't be happy unless they feel they can always contribute a suggestion. In that case, offer the words, and be aware that you will probably see him / her again. I've used this suggestion across almost all of my projects, especially with people who constantly have "good ideas." It is particularly powerful for people who just want to add their own 2 cents to a project but want someone else to do the work (or "feel" they don't have the time). End users, stakeholders, senior managers, my wife even taught it to our PTA President for use in meetings and interactions with parents; it resolves a lot of "suggestions." This doesn't mean that you shouldn't implement suggestions that are provided. As a leader, one of your tasks is to evaluate the suggestions against the time (and budget) you have available to determine priorities. Sometimes the suggestions absolutely should be implemented. In other cases, the idea may be good, but the requirements aren't feasible or require closer examination. And sometimes the suggestions are either completely impossible or not worth the cost in time and money to do. That is the call you (typically) have to make. A special thank you to my friend, otherwise I might not have thought to share this until much later. Thank you! Now, I would love to learn how you deal with similar situations. Do you have a key phrase you find useful? In what situations is it used? Comment below to let me know.